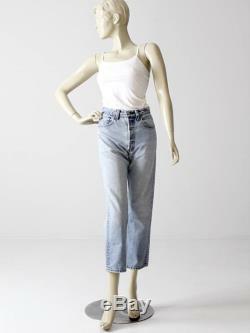 A pair of vintage levi's 501xx denim jeans. 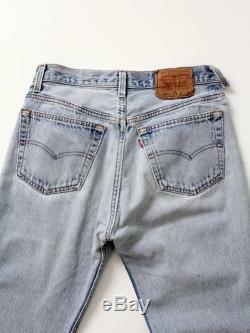 The "shrink to fit" jeans feature a straight leg, high waist, button fly, and red tab on the back pocket. 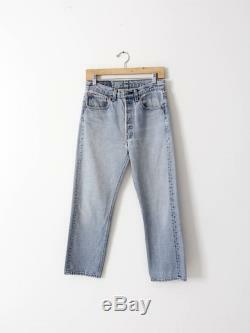 Great crop length levi strauss style 501xx worn in denim straight leg 5 pocket button flyconditionin good, pre-owned condition. 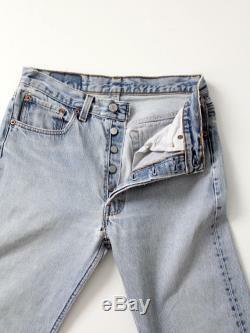 There is a small worn hole in the crotch and one of the back belt loops is unstitched at the bottom. Marked size: 32 x 30measured size: 29.5 x 26measurementswaist: 29.5. 27.3 cmhips: 39.5. 100.3 cmfor best fit, please compare measurements with a pair of your own pants. 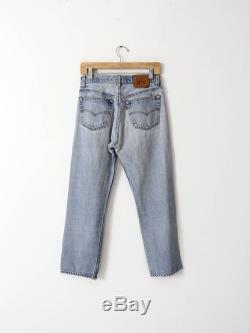 How we measurejeans measured lying flat. Waist measured across the bottom seam of the waistband on the back. Inseam measured up the inside of the legs. Rise measured from the crotch to the waist up the front. Hips measured across the pants just below the bottom of the fly seam. Thigh measured across the leg near the start of the leg/crotch seam. Ankle measured at the leg hem.